Partly cloudy early then becoming cloudy with periods of rain this afternoon. High 72F. NNW winds at less than 5 mph, increasing to 15 to 25 mph. Chance of rain 80%..
Cloudy and damp with rain early...then becoming mostly clear overnight. Low 46F. Winds NNW at 15 to 25 mph. Chance of rain 80%. Marilyn McAllister, of Bettendorf, looks back before stepping over a log during a search and rescue training at Illiniwek Park in Hampton, Sunday, April 7, 2019. Her son, David McCallister, has been missing since May 11, 2017. She took part in an intense weekend of training to be certified in search and rescue. Jesse Hammes of Davenport stands on a hillside in back of the Kohl's department store on Elmore Avenue, talking about the erosion that has occurred on his property because of stormwater runoff. Behind him is one of two concrete storm sewer pipes that drains the parking lot. In front of the pipe, lying on the ground, are three pieces that broke off when they were exposed as water gushing out of the pipe eroded the slope of the hill backwards until it created a deep, nearly vertical cut. A good Monday to all. Today is Tax Day. Have you filed your tax return yet? Time is running out. 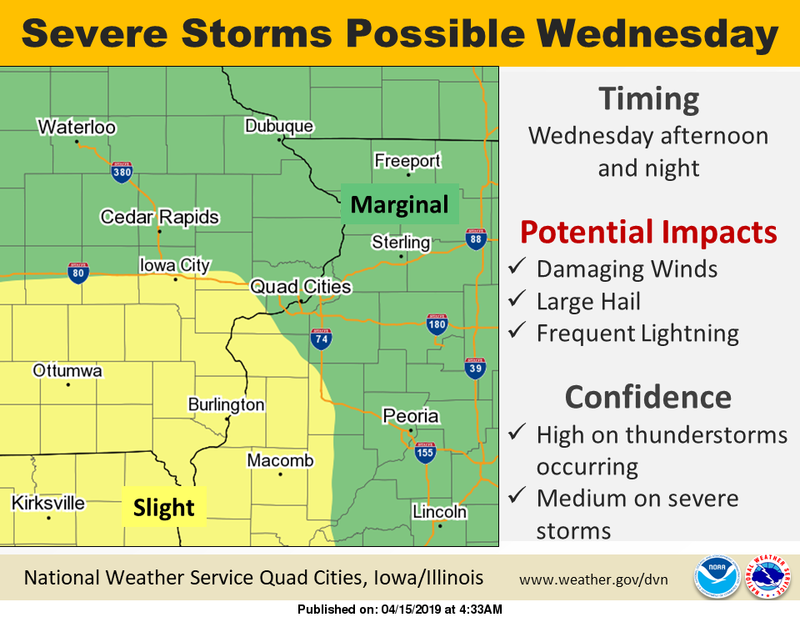 Here are the weather details from the National Weather Service. Today we could see some scattered sprinkles between noon and 2 p.m. Otherwise the day will be mostly sunny with a high near 54 degrees and a low around 47 degrees. Tuesday will be mostly cloudy with a high near 71 degrees and a low around 54 degrees. There's a 30% chance of showers and thunderstorms overnight. Area rivers are experiencing flooding. When it rains, it pours, and Ray Eddleman was in a deluge. For many years after his 11-year-old niece, Trudy Appleby, vanished from her Moline home in 1996, his family was devastated by grief and uncertainty. In October of 2014, his sister and Trudy's mother, Brenda Gordon, was struck and killed by a drunken driver while crossing the street. On that same day, Ray Eddleman was laid off from his job. Not even three months later, his mom, Trudy's grandmother, Ann Eddleman, passed away at 77. "I was in a pretty dark place," he said. Eddleman had met Dennis Harker, whose son, David Harker, went missing in 2013 and later was discovered to have accidentally drowned. The two men had no idea they were to become "like a second family," Eddleman said. Ray Eddleman needed something to do, so he started helping Dennis Harker get a second-hand store, Treasure Chest Resale Shop, up and running. The store would provide financial support to the group Harker founded after his son's death to help other families who would find themselves in the painful position he and his wife, Alice, had endured. It helped Eddleman, being distracted by the needs of Harker's Quad-Cities Missing Persons Network. Volunteers engage in a "quick sweep" during search and rescue training at Illiniwek Park in Hampton, Sunday, April 7, 2019. The 16 group members who took part are associated with the Quad-Cities Missing Persons Network. Brad Goering, of Bennett, checks his compass to ensure a straight search pattern during search and rescue training at Illiniwek park in Hampton, Sunday, April 7, 2019. A group of 16 people earned certification or re-certification in search and rescue during an "intense" weekend of training and testing. Team leader Dennis Harker picks up a T-shirt left as a clue during a search and rescue training at Illiniwek Park in Hampton, Sunday, April 7, 2019. Harker is founder of the Quad-Cities Missing Persons Network, which helps families who have lost loved ones, such as Harker's son, David. Ray Eddleman, of Silvis, looks up while doing a 360 scan of his assigned area during a search and rescue training at Illiniwek Park in Hampton, Sunday, April 7, 2019. Eddleman is the uncle of Trudy Appleby, who was 11 years old when she disappeared from her Moline home. Illinois Search & Rescue Council instructor Justin Kness advises a group of 16 volunteers who received training and certification in search and rescue at Illiniwek Park in Hampton, on Saturday, April 6, and Sunday, April 7, 2019. Illinois Search & Rescue Council instructor Andrew Simerson gives tips on how to ensure an accurate compass reading in Hampton, Sunday, April 7, 2019. Simerson was among four volunteers from the state group who offered training to 16 people from the Quad-City area. Jan Wagner, of Rock Island, climbs over a log as she keeps her eyes peeled on her assigned area during a search and rescue training at Illiniwek Park in Hampton, Sunday, April 7, 2019. Marilyn McAllister, of Bettendorf, points to a T-shirt hidden behind a tree as a clue during a search and rescue training at Illiniwek Park in Hampton, Sunday, April 7, 2019. Team leader Dennis Harker hikes ahead of volunteers during a search and rescue training at Illiniwek Park in Hampton, Sunday, April 7, 2019. Kendahl Goering, of Bennett, stops to scan her area with her compass around her neck during a search and rescue training at Illiniwek Park in Hampton, Sunday, April 7, 2019. Brad Goering, of Bennett, walks through his assigned area during a search and rescue training at Illiniwek Park in Hampton, Sunday, April 7, 2019. Team leader Dennis Harker walks alongside Ray Eddleman to begin another phase of search and rescue training at Illiniwek Park in Hampton, Sunday, April 7, 2019. In the foreground is Marilyn McCallister. All three search and rescue volunteers have personal experience with missing loved ones. Team leader Dennis Harker collects a clue found during a search and rescue training at Illiniwek Park in Hampton, Sunday, April 7, 2019. Kendahl Goering, of Bennett, ties a marker to keep track of areas her team already covered during a search and rescue training at Illiniwek Park in Hampton, Sunday, April 7, 2019. Illinois Search & Rescue Council instructor Justin Kness gives instruction to volunteers before beginning a search and rescue training at Illiniwek Park in Hampton, Sunday, April 7, 2019. Ray Eddleman scans his area during search and rescue training at Illiniwek Park in Hampton, Sunday, April 7, 2019. Eddleman, the uncle of missing Moline girl Trudy Appleby, was re-certified by the Illinois Search & Rescue Council after an exhaustive weekend training and testing challenge. Jenn Hamer, of Davenport, works her assigned area during a search and rescue training at Illiniwek Park in Hampton, Sunday, April 7, 2019. "We were still working on the Treasure Chest when Dennis asked if I was interested in getting involved with the search and rescue group," Eddleman said. "Getting involved with it really drug me out of the rut I was in. It gave me an out — a place for the pain I was feeling. "I do the search and rescue because of Trudy, but I do it for the families of everyone else. The feeling of helping another family that is in the same situation as my family, knowing how they feel, that propels me to want to help put an end to what they're going through. Read more. "Failure to comply with the requirements contained within this notification will force us to initiate compliance actions including, but not limited to civil citations," the letter to Kohl's Milwaukee headquarters stated. Last week — 4½ years later — a contractor for Kohl's began work to address problems behind the store where 9.4 acres of land it owns drops sharply down to Pheasant Creek. When Kohl's was built during 1993, two concrete drainage pipes were installed underground to convey water from parking lot intakes to the back of the property where it simply dumped out. Over time, water flowing — sometimes gushing — out of the two pipes eroded the slope of the hill backwards until it created two deep, nearly vertical cuts that, in addition to looking like they could collapse any moment, exposed portions of the originally-buried pipes. Sections of the pipes broke off, and flowing water dug new gullies as it drained toward Pheasant Creek. Read more. The Putnam hosted Dogs With Jobs on Sunday in Davenport. Dogs With Jobs showcased service and therapy dogs from the Quad-Cities Canine Assistance Network, Quad Cities Dog Obedience Club and Pawsitive Hearts. Therapy dog Abbey enjoys being petted by children during the "Dogs With Jobs" event. Davenport Police officer Jason Gillaspie lets the crowd pet his dog, Rikers, after speaking about their working relationship on the force during Dogs With Jobs at the Putnam Museum, Sunday, April 14, 2019, in Davenport. Dogs With Jobs showcased service and therapy dogs from the Quad Cities Canine Assistance Network, Quad Cities Dog Obedience Club and Pawsitive Hearts. Harmony Umporowic, 12, of Rock Island, pets Sassy, a therapy dog, during Dogs With Jobs at the Putnam Museum. TJ Shubert, vice president of Pawsitive Hearts, talks with Evan Campbell about Magpie and what services she contributes. Debbie Flaugher holds onto Cherry while she gets attention. Bailey, the service dog, gets attention after her presentation. Oliver, the service and therapy dog, waits for attention during "Dogs With Jobs" at the Putnam Museum. Davenport Police Officer Jason Gillaspie speaks about his dog, Ryker, during the "Dogs With Jobs" event at the Putnam Museum Sunday,. Alivia Ryder, 5, of Davenport, pets Raina, a therapy dog, during "Dogs With Jobs" at the Putnam Museum. Tracy Rice, of Aledo, lets children attendings pet her therapy dog Bogey. Captain the dog gets a head scratch while guests are educated on service animals. Emma Ziegler, 9, of Washington, pets Oliver the therapy dog. Fred Harris has been coaching football in the Quad-Cities for about four decades and he has seen a lot of high-octane, high-stepping, high-profile running backs in that time. Roger Craig. Tavian Banks. Marques Simmons. David Johnson. But Harris remembers this one other guy who predated all of those backs who was every bit as good, if not better. He didn’t see all of his great runs because they sometimes occurred behind him and he’s admittedly a little biased, but Harris hasn’t seen anyone he thought was better than Curtis Craig. Craig will be one of this year’s inductees into the Quad-City Sports Hall of Fame. He will be honored along with Jayme Olson and Murray Hurt on May 5 at the Quad-City Times’ annual Salute to Sports at Bettendorf High School. Read more. All-state basketball player at Moline High School. First team All-Big Ten at Iowa in 1992, second team in '91 and '93. Finished as Big Ten career leader in blocked shots (365). Collected 1,779 points (No. 3 in Iowa history) and 811 rebounds (No. 7) from 1990-93. No. 1 draft pick of Boston in 1993. Played four years in NBA for Celtics, Raptors and Bucks, then played eight years in overseas leagues. Adam Lingner kind of figures his entire athletic career was a longshot. He received one of the last available football scholarships at the University of Illinois in 1979. He was selected in the ninth round of the 1983 NFL draft. The draft doesn’t even have that many rounds anymore. And yet, the former Rock Island Alleman multi-sport star somehow ended up spending 13 years in the NFL and playing in four consecutive Super Bowls as a member of the Buffalo Bills. It all happened because Lingner was astonishingly accurate at rifling a football backward between his legs. "My whole thing of playing in the NFL was just such a longshot," said Lingner, now 57. "I barely got a scholarship to Illinois." The longshot is still paying off. More than 20 years removed from his final game, Lingner will be one of this year’s inductees into the Quad-City Sports Hall of Fame. He will be honored, along with Franc Freeman and Jenni Fitzgerald, at the 37th annual Quad-City Times Salute to Sports on May 7 at Bettendorf High School. Wayne DeSutter, who served as Alleman’s head football coach during Lingner’s high school career, recalls that Lingner not only was a very good athlete but got high marks for character and work ethic. "He was as quality a young man as you were ever going to find," said DeSutter, who now lives in Leesburg, Florida. "And he was just a good athlete. He went to the U of I and progressed every year. He got his chance and took advantage of it." Bob Smith, the assistant coach who recruited Lingner for Illinois, said he was one of his favorite players he ever coached, a great person, an exceptional athlete and an almost impeccable snapper. "It was almost a gift," said Smith, now retired and living near Peoria. "You could see he worked so hard on it, and he was just outstanding. "I think he stayed around in the NFL for the first eight or nine years because he stayed in good shape and could play as a backup center. He wasn’t just a snapper in the beginning. But the true thing that kept him in the NFL was he was the best snapper in the league." The late Bruce DeHaven, who served as the Bills’ special teams coach for much of the time Lingner was with the team, often said he would take Lingner over any other long snapper. "When it's fourth-and-7 and you're holding onto a touchdown lead and you're kicking out of your end zone late in the game, you're mighty happy that you have Adam Lingner back there," DeHaven said in a 1992 interview. "There may be snappers in the league who are as good as Adam, but I know there's nobody who's any better." There was no mystery where Lingner got his work ethic and quest for excellence. His father, Wesley, worked very hard in a variety of sales jobs, and his mother, Marion, was the night switchboard operator at the Rock Island Argus while holding various other part-time jobs. Smith said one of the things that sold him on Lingner as a prospect was meeting his parents. As the third oldest of four boys, Lingner began playing about every sport at a very early age. "I remember being the kid that was hanging around during my brother’s practices," he said. "While they were working at one end of the basketball court, I’d be at the other end shooting hoops or sometimes just sitting and listening to the coach." His football career began in a sixth-grade YMCA football league at Douglas Park in Rock Island on the same field on which the first NFL game was played in 1920. "So there I am in the sixth grade, playing on the same field that Jim Thorpe played on," Lingner said. "And then I go to college and I’m playing on the same field that Red Grange played on. When I found that out in 2014, I was standing in the (pro football) Hall of Fame and I started getting a little emotional. … It just kind of hit me like a ton of bricks how intertwined my life has been with the NFL." His athletic career took a fateful turn very early in his first year at Alleman in a seemingly innocuous exchange with freshman coach Don George. "That weekend I was snapping punts for the freshman team and another week later I was snapping for field goals and extra points. This was pretty natural. I don’t ever remember doing it before then. I don’t remember even just playing around with anybody. I pretty much think that was the first time I ever threw a ball through my legs." By his sophomore year, Lingner was suiting up for varsity games strictly to handle the snaps. As a junior and senior, he started at both offensive tackle and defensive end while also handling the snapping duties for a team that went 11-7 during that two-year period. "He kept working at it," DeSutter said. "He was a tremendous snapper in high school. He was a really good offensive tackle, too, but he could really long snap." Of course, that’s not all Lingner did from a sports standpoint. He also was a prominent member of the basketball team and fondly recalls a couple of times when he dunked on opposing big men, including Rock Island’s 6-foot-10 Blake Wortham. In track and field, he became the first Alleman athlete ever to place at state in a field event, taking eighth in the shot put as a senior in 1979. At 6-4 and 205 pounds — about 60 less than he weighed during his NFL career — Lingner had a handful of football offers from such schools as Western Illinois, Illinois State and Northern Iowa, but he held out hopes of possibly playing at a higher level. Illinois had showed some interest, but head coach Gary Moeller didn’t think the Alleman star was a great prospect. As Lingner learned many years later, Smith kept lobbying on his behalf. "At that level, I really just had one guy who really believed in me, and that was Coach Smith," Lingner said. "He fought with Gary Moeller, who wasn’t real excited about me. I was a pretty scrawny kid, but I had a big enough frame." Even Smith wasn't that sure about Lingner at first. "I remember watching some film, and I knew he was a good player, but what sold me was when I came up to watch a couple of basketball games," Smith said. "His athleticism was really outstanding. He could dunk and run and handle the ball and do things other big kids couldn’t." Smith finally won out. Lingner got a scholarship. Not surprisingly, he became Illinois’ long snapper right away as a freshman in the fall of 1979, although it took him some time to get any other sort of playing time. Moeller was fired after the Illini went 2-8-1 in 1979, and he was replaced by San Francisco 49ers line coach Mike White. The Illinois program began to improve steadily, and Lingner progressed along with it. He became the starting center as a senior in 1982, but he suffered a mid-season shoulder injury and missed a few games. He later got back into the lineup at guard and helped the Illini to their first bowl game appearance in 19 years. Lingner played well against Alabama in the Liberty Bowl and also was selected to play in the Senior Bowl, but he still wasn’t entirely sure he had a future in the pros. "The odds of me getting drafted and having the career I had, it was just time after time, just a longshot," he said. "It was a longshot that I’d be successful in big-time college football, Big Ten football, and then not having a huge career there … I mean, what are the odds?" The Kansas City Chiefs selected Lingner in the ninth round, and he became the lowest draft pick to make the team. He actually started one game as a rookie before eventually becoming primarily a long snapper. That was just fine with Lingner. "It’s hard to be a full-time player and a long snapper," he said. "I remember when I was snapping in high school, you’re so tired, you’re winded. It’s just harder to snap very well when you’re playing all the time and your hands are banged up, you’re exhausted, and then you’ve got to go throw a perfect strike every time." He stayed with the Chiefs until 12 games into the 1986 season, when he was released. He spent time on the rosters of both the Patriots and Broncos before landing with Buffalo in 1987. He ended up playing 140 regular-season games with the Bills and was with them through the agonizing stretch in which they lost in the Super Bowl four consecutive years. Lingner was one of only 20 players who were on all four of those teams. The most distressing of those losses was the first one, in 1991. The Bills were in position to defeat the New York Giants as kicker Scott Norwood lined up for a 47-yard field goal in the final seconds. Lingner made a perfect snap, and Frank Reich, now the head coach of the Indianapolis Colts, made a perfect hold. Norwood’s kick sailed wide to the right and the Bills lost. Lingner learned years later that his father, who suffered from heart disease, had to take seven nitro pills to cope with the stress as he sat and watched from the stands. The Bills lost to the Redskins in the Super Bowl the following year and to the Dallas Cowboys in both 1993 and 1994. Lingner said he still encounters fans who tell him how hard it was for them to watch their team get to the big game year after year and then lose. He reminds them that it also was pretty hard on the players themselves. "I can say honestly, though, maybe they do feel worse about it than me," he said. "I feel bad about it, and I think there were guys on our team who maybe feel worse about it. "Sometimes I feel worse that I don’t feel worse about it because I’m just one of those silver lining guys. I try to find the positive in everything because if you don’t you’re just going to make yourself miserable. … It still was an amazing accomplishment for our team." Lingner finally retired from football following the 1995 season, citing tendinitis in his knees and chronic elbow injuries. He was able to stay in the league for so long because he was so dedicated to his craft. Even now, he seems to remember every imperfect snap he ever made. Not that there were that many. He said in 21 years as a long snapper through high school, college and the pros, he never once had a snap sail over the head of a punter although he said he came close to doing it in his final game. He also remembers a bad snap on an extra-point kick during a 1989 game against the New York Jets. His snap veered toward the holder’s helmet and slithered through his hands. "We won the game and I was miserable. We won the division and I was miserable," Lingner said. "I guess the moral of that story is my expectations were really high. I wasn’t used to missing snaps." DeHaven said in a 1992 interview that it was the only bad snap Lingner made over a five-year stretch. That included practice and training camp. Lingner also recalls what he believes is the best snap he ever made. It came on Jan. 3, 1993, in a memorable playoff game against the Houston Oilers, in which the Bills made the biggest comeback in NFL history. After falling behind 35-3 in the third quarter, Reich stepped in at quarterback for the injured Jim Kelly and led a furious rally to tie the score at 38-38 and send it to overtime. In the extra period, the Bills got into position for a game-winning 32-yard field goal. It was one of those frigid, blustery days in Buffalo, and Reich, as the holder, asked Lingner to deliver the ball slightly lower than normal to minimize the effects of the wind. "That was a moment for me. I enjoyed it at the time, but it’s one of those where I can look back now and just think ‘Wow.’"
Lingner hasn’t found his post-football career to be quite as exhilarating. 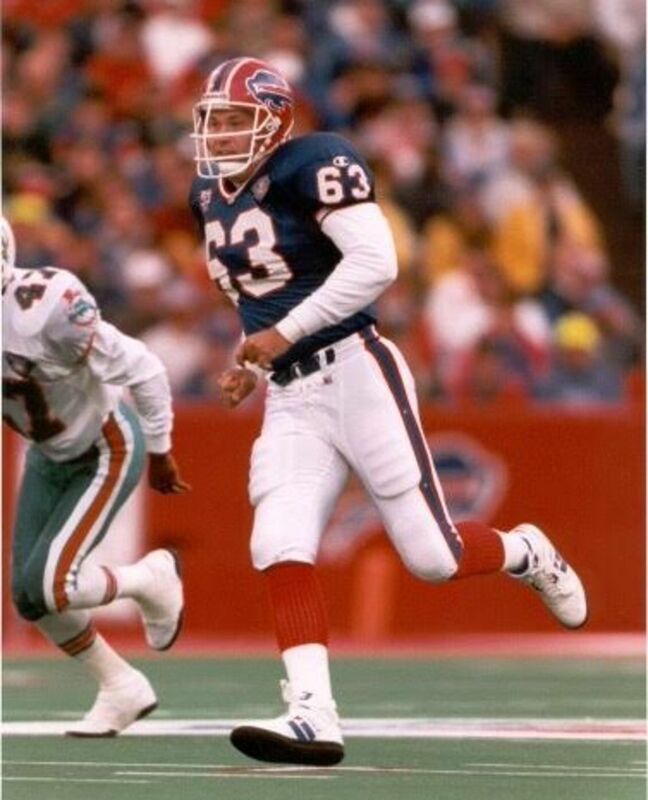 He has worked a variety of different jobs, dabbling in radio work, working in the Bills’ marketing department and opening a horse stable in Buffalo. He now lives in Frisco, Texas, where he works for Sprout Foods Inc.
"The hardest thing about going from that very competitive industry into other industries is you’re so used to working with people who are highly motivated," Lingner said. "And then you go to work in the real world with people that aren’t that motivated." He said he hasn’t stayed in close touch with many of his old teammates although he still is good friends with Steve Christie, the kicker who booted that memorable game-winner in Houston in 1993. However, he still loves seeing former teammates at Bills reunions, including one to celebrate the 25th anniversary of the comeback game just a few months ago. "There’s nothing I enjoy more than having a reason to get together with everybody," he said. Grew up in Preston, Iowa. Won Iowa high school state championships in both shot put and discus. Set world records in shot put indoors in 1971 and outdoors in 1973. Member of 1972, ’76 and ’80 U.S. Olympic teams. Gold medalist in ’71 Pan-Am Games. Five-time winner of Drake Relays. Founder and longtime coach of Pena’s Davenport Boxing Club. Coach of 1981 U.S. Junior Olympic team. State and region Golden Glove coach of the year many times. Member of National Golden Gloves Hall of Fame. Amateur coach for professional standouts Michael Nunn and Antwun Echols. Multi-sport athlete at Davenport Central and St. Ambrose. Assistant coach on Central state championship volleyball team in 1981. Head coach at Central for four years before becoming first head coach at Davenport North, where she went 597-316 in 27 years with state titles in 1988 and ’97 and eight other state tournament appearances. Iowa coach of the year in ’97. MAC coach of the year nine times in first 18 years. First Quad-Citian to earn spot on LPGA Tour. Among top 100 money-winners in five of first seven years on tour. As amateur, won Iowa Junior Open, Des Moines Open, Waterloo Junior Open, Quad-City Women’s Amateur and Iowa Women’s Open. Voted Iowa State University female athlete of the year in 1996. Former Davenport West athlete served as head women’s basketball coach at Toledo (1988-95) and Iowa State (1995-present). Previously was assistant at William Penn, Fresno State and Notre Dame. Went 166-53 at Toledo and has won more games (434) than any coach in any sport in ISU history. Overall career record of 600-259. In 27 years as head coach, has won 17 or more games 26 times. Head baseball coach at Davenport Central for 25 years (1960-84). Won six state titles, four at Central and two at Corwith-Wesley. Finished second at state three times. Career record of 588-231. Member of Iowa High School Baseball Coaches Association Hall of Fame. National coach of the year in 1980. As minor league pitcher, won 21 games in both 1948 and 1950. Highly successful football coach for 17 years at Geneseo High School and 16 years at Augustana College. Compiled record of 146-21-4 at Geneseo from 1962-78, winning 52 straight games and three straight state titles (1976-78). Went 146-23-1 at Augustana from 1979-94, winning four straight NCAA Division III titles (1983-86) and going 60 consecutive games without losing. Named CCIW coach of the year nine times, and award is now named in his honor. Voted into College Football Hall of Fame in 1998. Football and track star at Rock Island High School in 1956 and ’57. Helped Western Illinois to back-to-back undefeated football seasons in 1960 and ’61. Starting cornerback for Buffalo Bills 1962-69 and Denver Broncos in 1970. Member of AFL championship teams in 1964 and ’65. Had 23 career interceptions. Multi-sport athlete at Moline High School. Three-year starter in football at University of Illinois. 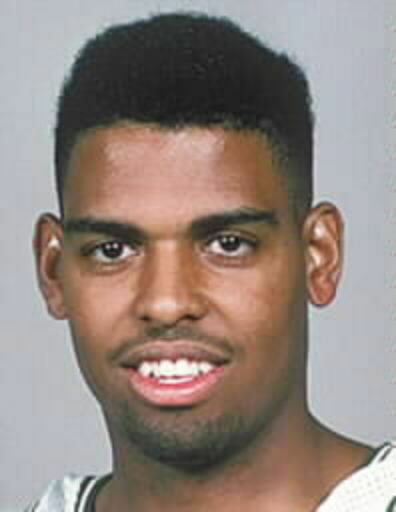 Captain and first-team All-Big Ten in 1992. First-round draft choice of Houston Oilers (13th pick overall) in 1993. Longtime starting left tackle for Oilers/Tennessee Titans. Played in 2001 Pro Bowl and Super Bowl XXXIV. All-Western Illinois football player at Prophetstown. Four-time letterman as defensive lineman at Iowa, serving as captain in 1992. Served as assistant coach at Iowa, Kansas State and Wisconsin before becoming head coach at Wisconsin at age of 36. Winningest first-year head coach in Big Ten history, leading Badgers to 12-1 record in 2006, then guided them to Rose Bowl following 2010 season. Now head coach at Arkansas. Helped Davenport High School to three straight state basketball titles in 1950-52. Became all-time scoring and rebounding leader at University of Tennessee, averaging 19.1 ppg and 10.6 ppg over four-year career. Holds three Tennessee free-throw records. Selected by Minneapolis Lakers in 1956 NBA Draft. Member of Iowa Basketball Hall of Fame. Volleyball, softball, track and basketball star at Bettendorf High School. Two-time All-American in volleyball at Nebraska (1983-84). Only player ever to be three-time Big Eight tournament MVP. Four-time member of U.S. national team and alternate on 1988 Olympic team. Assistant coach on 1995 Nebraska team that won NCAA title. Coach/trainer for several college and junior teams. Longtime coach in girls basketball and softball at Pleasant Valley. More combined coaching victories than any woman in Iowa high school history. Compiled 661-317 record in softball, 322-184 in basketball. Member of IGCA Hall of Fame for both sports. Organized first women’s basketball team at Northern Iowa. Member of UNI Hall of Fame. Won 12 varsity letters at Bedford (Iowa) High School. Four-time state champion wrestler at Clinton High School (1984-87) with 128-0 career record. Six-time junior national champion. Fourth at 126 pounds in NCAA meet at Iowa State in 1989. Coach at Mount St. Clare College, Clinton, and Bettendorf. Coached Bettendorf to four state titles as of 2015 (two dual, two traditional). Member of Iowa Wrestling Hall of Fame. Olympic bronze medalist in four-man bobsled in 2002. Alternate on 1998 Olympic team. Eight-time Mid-Continent Conference track champion at Eastern Illinois. NCAA 400-meter hurdles champion in 1992. Two-time All-American. Silver medalist in 1999 Pan American Games decathlon. Fifth in 2000 Olympic trials. Now track coach at University of Northern Iowa. Two-time Olympian in bobsled. Finished 12th in four-man bobsled in 1998 and ninth in two-man in 2002. Mid-Continent Conference track athlete of the year at Eastern Illinois in 1992. All-American in 1991. Silver medalist in decathlon at 1994 Olympic Sports Festival. Bronze medalist at 1993 World University Games. Now CEO of U.S. Bobsled and Skeleton Federation. Career record of 410-418 in 39 years as head basketball coach at Davenport West (1966-2004) and North Scott (2005-06). Led West to Iowa state titles in 1971 and 1994 with ‘94 team going 24-0. Led Falcons to eight state tournament appearances. Member of Iowa high school Hall of Fame. Three-year football letterman at Coe College. Winning pitcher in 1954 baseball All-Star Game. Was 12-10 with 3.22 ERA with Washington Senators in 1954. Career record of 29-39 in eight seasons in majors with Senators, Red Sox, Cardinals, Colt 45s, White Sox and Orioles. Threw two no-hitters in minors in 1952. Once struck out 21 batters in seven-inning game at East Moline High School. Sportswriter at Quad-City Times for 37 years, retiring in 2006. Formerly worked for newspapers in Muscatine, Oskaloosa and Marshalltown, Iowa. Winner of numerous awards, including Iowa’s sportswriter of the year by the National Sportswriters and Sportscasters Association. Record of 401-257 in 32 years as basketball coach at LeClaire, Wilton and Davenport Central, 1952-85. Won state title at Central in 1970. Later served as athletic director at Central for 14 years. Played semi-pro baseball in seven decades with Muscatine Red Sox. Member of IHSAA Basketball Hall of Fame. Executive secretary of Mississippi Athletic Conference. Fixture in the local high school coaching ranks for 33 years, all at Rock Island Alleman. Compiled overall record of 491-335 with four seasons of 20 or more wins. His 1963-64 team put on a late surge to advance to final four of state tournament. Alleman gym is now named for him. Was standout athlete at St. Ambrose and Streator (Ill.) High School. Led Rock Island basketball team to two-year record of 47-7 (1957-58). Became all-time leading scorer at Iowa with 1,522 points (21.2 ppg). Named All-Big Ten in 1961 and ’62, All-American in ’62. Played 14 seasons in NBA (1962-76), 11 with the Boston Celtics. Played for five NBA championship teams and scored 10,898 points. Spent 31 years as head coach with Milwaukee, Golden State, Dallas and New York Knicks. Winningest coach in NBA history with 1,335-1,063 record. Sports and news anchor for 38 years at WHBF in Rock Island while also doing radio work on WKBF. Retired in 2000. Play-by-play voice of Rock Island High School basketball and football for many years. Worked in Texas, South Dakota and Freeport, Ill., before coming to Quad-Cities in 1962. Head basketball coach at Rock Island High School from 1981-2000. Winner of 643 games in career. Led Rocks to Elite Eight of Illinois state tournament eight times and Final Four in 1988, ’89 and ’95. Also served as head coach at Lincoln (Ill.) High School and Dodge City (Kan.) Junior College and assistant coach at Kansas. Standout basketball and track athlete at Davenport West High School. Director since 1980 of Quad-City Times Bix 7, largest non-marathon road race in Midwest for more than quarter century. Named national race director of the year in 1993. Founding father of Professional Road Runners Organization. Davenport native became fullback on legendary Four Horsemen backfield at Notre Dame. Was biggest of the “horsemen” but also possessed great speed. Scored three touchdowns in 1925 Rose Bowl, two on interceptions. Served as football coach at Columbia College (now Loras), Duquesne and Notre Dame. Was 47-13-3 in seven years (1934-40) at Notre Dame. Served as commissioner of NFL for five years (1940-46). Four-time state high school wrestling champion at Maquoketa (1993-96) with career record of 144-0. Four-time NCAA Division I All-American at Iowa. Finished third in 1998 and ’99, NCAA champion in 2000 and ’01. College career record of 120-13. Undefeated as junior, won 65 of last 66 matches. Big Ten wrestler of the year as senior in 2001. Head coach at Augustana College. Franc Freeman wasn’t into winning popularity contests. As the head coach of the varsity wrestling team at Bettendorf High School for more than a quarter century, he could be very tough, occasionally cantankerous and usually brutally honest. "Franc didn’t hold back," admitted Sally Freeman, his wife. But his intentions were always pure. And the irony was that he ultimately became popular anyway with both peers and proteges. Many of those who wrestled for him look back now and realize they were receiving powerful life lessons as well as expert guidance in how to maximize their potential on the wrestling mat. "We knew deep down he always wanted the best for us," said Dr. John Kern, who wrestled for Bettendorf in the late 1970s. "He helped set the work ethic that has stayed with me throughout my life. I can tell you this: As much as I disliked Franc at times and his way of coaching, I know he helped make me the person I am today." Along the way, Freeman also managed to be one of the most successful coaches in the state of Iowa. He won 250 dual meets and two state championships. For all those reasons, he is one of this year’s inductees into the Quad-City Sports Hall of Fame. He will be honored along with Jenni Fitzgerald and Adam Lingner in ceremonies at the Quad-City Times Salute to Sports on May 7 at Bettendorf High School. Dr. Kern is just one of many who regard Franc Freeman as one of the central influences of their life. "He taught me work ethic, values and good sportsmanship," said Kurt Habenicht, who was a member of Bettendorf’s 1975 state runner-up team. "I love him and will never forget the impression he made on me." Paul Glynn was a state champion at Bettendorf before going on to wrestle at Iowa under the legendary Dan Gable. His son, Paul Glynn Jr., is now a member of the Iowa team. "He shaped me into the man and wrestler that I became …" Paul Glynn Sr. said of Freeman. "Coach Gable taught me some of these very same lessons and was a heck of a coach, but when I think back, I still consider Franc the best coach I have ever had." As a young man, the 79-year-old Freeman was a very good wrestler in his own right. He grew up in a tough westside neighborhood in Davenport, the oldest of seven children. His younger brother, Melvin, later won a state title at Davenport West in 1965, but Freeman said all the kids in the neighborhood got out in their backyards and wrestled. One of them, Vince Garcia, went on to be an All-American at Iowa. Freeman remembers the Reimers brothers, Pee Wee and Big Shot, as being very tough. He said Rose Garcia may have been the toughest of all. His father, Franc Sr., owned a foundry and demanded that all his children be involved in the family business rather than taking part in extracurricular activities at school. Because of that, Freeman never even went out for the wrestling team at Davenport High School until his junior year, in 1954. Franc Jr. finally went home one day and informed his dad he had defied him and gone out for the team anyway. "My dad just said 'Well, once you’ve started something you better finish it,'" Freeman said. He competed only at the junior varsity level that year but went undefeated. When he rolled through a tournament at the YMCA early in the following season, including a pin against a defending Illinois state champion from East Moline, Davenport coach Jim Fox put him into the varsity lineup. Freeman finished second in the state at 120 pounds in 1956, losing to Dee Brainerd of Fort Dodge in the finals, and helped Davenport High win the team title. Freeman had joined the Navy Reserves in order to get the $300 he needed to buy a new car, so when he graduated from high school he entered the Navy. He spent most of that time at Great Lakes Naval Air Station near Chicago and continued to hone his skills wrestling for Navy teams in AAU tournaments. Two years later, when he got out of the service, he intended to go back to work in the family business. But Fox, who was inducted into the Quad-City Sports Hall of Fame in 1989, suggested Freeman try wrestling at the college level. He enrolled at Iowa State Teachers College (now Northern Iowa) and by his sophomore year had worked his way into the starting lineup. He earned NCAA Division I All-American honors in each of his last two years, losing in the 123-pound semifinals as a junior and placing second as a senior. Freeman was interested in getting into coaching, and UNI coach Bill Koll recommended that he not settle for anything less than a head coaching job. Through Fox, he learned of an opening for a head coach at a new high school in Billings, Montana. In two years at Billings West, Freeman built a program that would begin winning state titles after his departure. However, in 1964, Fox told him of an opportunity to come back to the Quad-Cities as the head wrestling coach and business education teacher at Bettendorf. Freeman was a bit apprehensive until he got a look at his wrestlers. "I came home to Sal," he said, "and told her 'I’ve got a team here that won’t stop. We’re really going to go places with this.'" It took some time, however. In those early years Bettendorf was a member of the Little Six Conference and was mostly competing against small schools. Freeman went to athletic director Wendell Hill and told him the only way Bettendorf could become a statewide power was if it could start scheduling larger schools. By the early 1970s, Bettendorf grew into a powerhouse program. The toughened schedule helped but so did a no-nonsense approach when dealing with his athletes. "Franc was a real disciplinarian," Sally Freeman said. "You had to play by the rules if you wanted to be on his team." Freeman had his first individual state champion in 1973 when Pat Wright won at 185 pounds, and two years later the Bulldogs finished second in the state meet behind West Des Moines Dowling, earning Freeman his first Iowa coach of the year award. The big breakthrough came in 1981 when the Bulldogs won the Class 3A state title with three individual champions — Glynn at 119 pounds, Brian McCracken at 185 and future Iowa football star Hap Peterson at heavyweight. Freeman had that team very well-prepared before it reached the state meet in Des Moines. "I put a bunch of paper up on the walls of our wrestling room and started drawing faces on it," Freeman said. "Then I got a tape recording of a lot of screaming and yelling. We’d go into the wrestling room, turn on that noise box, and I had to coach over all that noise and they had to wrestle through the noise." When the Bulldogs got into the raucous, sometimes hostile atmosphere of Veterans Auditorium, they felt right at home. At the team’s welcome home celebration at the school gym, Freeman told the crowd: "Had I known winning would feel this good, I wouldn’t have waited 17 years to do it." Bettendorf was even more dominant the following year. It had only one individual state champion (McCracken again) but placed in 10 of 13 weight classes and registered a state-record 167.5 team points. The mark stood for 19 years. "That 1982 team is the toughest bunch I ever had," Freeman said. The Bulldogs continued to be a state contender in the years that followed although they never won another title under Freeman. After finishing fourth in 1991, Freeman retired. More honors rolled in as the years passed, including inductions into several different halls of fame. In 2012, Bettendorf’s new wrestling room was named in his honor. In 2017, he was delighted to get a chance to serve as the honorary coach for UNI at a dual meet with Eastern Michigan. Many years ago, Franc and Sally purchased a 10-acre plot of land in the country north of Bettendorf where they started a tree farm and landscaping enterprise. They sold that business to a former employee in 2002 but still live on the property and have businesses in which they grow asparagus and cultivate new breeds of hostas. Freeman sells more than 2,000 different varieties of hostas, many of which he has developed himself and named for people and things close to him. There is "Coach Jim Fox," "Gable’s Gold," "Northern Iowa Wrestling," "Franc’s Fight Nite," and "My Gal Sal." Almost all of them are registered with the American Hosta Society. Franc’s Fight Nite is an event Freeman began more than 40 years ago as a social gathering for wrestling coaches, athletic directors, officials and fans to get together and socialize. "They go somewhere and eat and drink and then they start wrestling," Sally Freeman said. "Those can be pretty wild nights." The event is held in May and continues to this day even though the ex-coach is battling Parkinson’s disease. Freeman’s most enduring legacy, however, is the people he touched. Literally. Whenever he was speaking to a wrestler or to anyone, he made a habit of reaching out and touching them on the arm or shoulder to make sure he commanded their attention. Jim Bellig, a member of some of Freeman’s early Bettendorf teams, said he always noticed that it wasn’t only wrestlers who benefited from the Freeman touch. "I would see the way he would spend time trying to mentor kids that did not have sports, band, etc., to lean on for support or direction," Bellig said. "Kids that he knew maybe did not have the benefit of a good home situation for support. "He did not favor the athletes, as you saw some coaches do. He spent time and energy with kids who needed the support most." Bellig said he still picked up a few life lessons from Freeman when he saw him recently at a birthday party. "Love him like a father," he said. Former Clinton, Iowa, resident was the first black athlete to play football in the Big Ten. Named to Iowa’s all-time team and a member of the National Football Foundation and Helms Athletic Foundation halls of fame. Named first-team All-Big Ten three straight times and a consensus All-American tackle in 1921. Played pro football for 10 years, many of them with the Rock Island Independents. Later became circuit court judge. Illinois state swimming champion for Moline High School in 200 freestyle in 1968, 100 free in 1969. Was 15-time All-American at Indiana. Big Ten 200 champion in 1970. Part of NCAA champion 800 relay in 1973. Swam prelims of 400 and 800 gold medal relays in 1972 Olympics. Head men’s and women’s coach at Kentucky for 22 years. Member of Indiana Swimming Hall of Fame. Won eight letters in four sports at Davenport High School. Member of the 1964 U.S. Olympic track team. Won national junior college high jump championship in 1961 and NCAA indoor and outdoor long jump titles at University of Arizona in 1964. Charter member of Arizona Sports Hall of Fame. Broke long jump and triple jump records in ’64 Drake Relays. Lifelong resident of Davenport was one of first two black players to play for Chicago Cubs in 1953. Spent eight years in major leagues with Cubs and Pirates, batting .265. Made National League All-Star team in 1955. Member of Pirates’ 1960 world championship team. First black manager for major league-affiliated minor league team at Batavia, N.Y., in 1961. Served as coach with Pirates and as scout with Pittsburgh for 20 years. All-state basketball player at Davenport High School in 1943. Earned 14 varsity letters at Davenport’s St. Ambrose Academy (now Assumption High School) in baseball, basketball, football and track. Made all-state in three sports. Captained both baseball and basketball teams at University of Notre Dame in 1959. Played minor league baseball in Chicago White Sox organization. Served as general manager of Quad-City Angels. Served as assistant executive director of NCAA. Moline resident was all-state football and baseball player at Rock Island Alleman in 1953. Attended Northwestern University. Major-league catcher and first baseman from 1959 to 1969 with Cardinals, Braves, Phillies, Red Sox and Cubs. Batted .246 with 93 home runs in 786 games. Hit 10 or more home runs in a season five times, including 21 with the Braves in 1965. Football and track star at Davenport High School in 1930s. All-Big Ten and All-American football player at Minnesota. Finished third in 1940 Heisman balloting and was MVP of 1941 College All-Star Game. Played three years with N.Y. Giants. Later the successful head football coach at Rock Island High School. Native of Lost Nation, Iowa, and longtime resident of Clinton, Iowa. American League batting champion with .358 average in 1906. Had 208 hits, 20 triples and 35 stolen bases in 1906. Career average of .301 in seven seasons as outfielder with St. Louis Browns. Batted .405 for Milwaukee in American Association in 1904. Later owned Lincoln team in Western League. Highly successful football coach at both high school and college levels. Was 65-29-12 at Augustana College from 1928 to 1940. Later directed Rock Island High School to 201-75-21 record with 17 conference championships and six undefeated teams. Retired as coach in 1961 and as athletic director in 1969. Was All-American as player at Minnesota before becoming youngest college football coach in the country in 1928. Part of powerhouse track teams at Davenport High School. Helped the Blue Devils to three state titles 1950-52. Won state half-mile championship as junior and senior. Co-captain of track team at University of Iowa. Coached Davenport Central for more than 30 years, winning 10 state titles in track and one in cross country. Elected to Track Coaches Hall of Fame in 1981. Became one of the top golfers on the PGA Tour in the 1950s and early ’60s. Best known for victory in the 1955 U.S. Open in San Francisco, where he beat Ben Hogan by four strokes in an 18-hole playoff. Won two other PGA events (1960 Phoenix Open and 1961 Bakersfield Open). Finished among PGA’s top 60 money-winners eight times in nine years (1955-63). Helped Davenport High to state titles in baseball (1942), football (1941) and basketball (1941) and also ran track. First four-time basketball letterman in school history. All-Big Ten basketball and baseball player at Iowa. Led basketball team to 17-1 record in 1944-45 and batted .414 for baseball team in 1945. Basketball coach at Iowa Wesleyan (1953-59) and Nevada (1959-72). Davenport Central grad was a third-round pick in 1991 NFL Draft. He played in 160 games (140 starts) on D-line with Browns, Broncos, Ravens and Lions. Multi-sport star at Davenport Central. All-Big Eight tight end at Nebraska. Third-round draft choice of New York Giants in 1983. Played 12 seasons in NFL with Oilers, 49ers and Raiders, catching 181 passes for 1,980 yards. Worked as artist, writer, film adviser and sports psychologist in post-playing career. Current Bettendorf softball coach led Alleman to state softball titles in 1992, 1994 and 1998 and also won state basketball title with Pioneers in 2005. Davenport native was a junior national speedskating champion at age 10, then went on to win 150 pro cycling races and competed in 1987 Tour de France. As an athlete at North Scott High School, Jenni Fitzgerald developed an appreciation for the change of the seasons. Basketball was always her passion, but on the volleyball court or the softball field, Fitzgerald learned and grew as a leader and a teammate. Her enjoyment came from the challenges, as well as from the plentiful success the Lancers enjoyed during Fitzgerald’s high school career. During her senior year, Fitzgerald earned first-team all-state honors in volleyball, basketball and softball. She was a setter on a North Scott volleyball team that won an Iowa state high school championship in 1985, the starting point guard on a basketball team that was undefeated until the 1986 state championship game and an outfielder for a North Scott softball team that was emerging as statewide power. "As much as anything, I liked being part of the team. I liked being around my teammates. They were my friends, and moving from one sport to another was something we just did," Fitzgerald said. "Today, there is so much specialization, and for a lot of the athletes who compete at a high level, that’s a good thing. But when I was growing up, most athletes played more than one sport, and I’m glad I had that chance." Fitzgerald said the experiences all created memories that have lasted a lifetime and helped guide her down her own career path, including in her present role as an associate head coach of the Iowa women’s basketball program. "The things I learned from the coaches I had at North Scott and Drake and from the experiences that I’ve had with the teams I’ve been a part of, they’re all a part of who I am," Fitzgerald said. Collectively, they played in a role in Fitzgerald being selected as one of this year’s inductees into the Quad-City Sports Hall of Fame. She will be honored, along with Franc Freeman and Adam Lingner, at the 37th annual Quad-City Times Salute to Sports on May 7 at Bettendorf High School. With an older sister, Robin, and a younger brother, Randy, Fitzgerald grew up around sports at the Long Grove home of her parents, Bob and Jan Fitzgerald. "There was always some sort of a game going on, and usually, I found myself in the middle of it," Fitzgerald said. By the time Bob Fitzgerald piled his daughter and a group of her friends into a car for a road trip to the Iowa girls state high school basketball tournament, basketball had already become the center of Jenni Fitzgerald’s athletic attention. "We were all in the ninth grade, and we had a great time," North Scott teammate Tracy Moore Lindaman said. "I remember us all talking that day about how there wasn’t any reason we couldn’t be playing at state someday, that we could be as good as those teams. I think it motivated us, and Jenni certainly was in the middle of that." Basketball for high school girls in Iowa was in the midst of a transition as Fitzgerald entered high school. She began her prep career playing the six-player game, competing as a forward, but North Scott switched to the five-player game prior to her junior year, and by the time Fitzgerald was honored as Miss Iowa Basketball as a senior in 1986, she was a two-time first-team all-state selection. At 5-foot-5 and with good ball-handling skills, Fitzgerald made a smooth transition to the five-player game and found herself surrounded by talent. "We had everything it took to have a good five-player team and for us the adjustment was probably easier than it might have been for some other teams," Fitzgerald said. "I was always fortunate to have teammates who could do good things with the ball. My job was to get the ball to them, and they made it work." Deb Menke, who coached Fitzgerald in both volleyball and basketball at North Scott, credits Fitzgerald with understanding how to make the team work. "Jenni was an outstanding athlete who was part of a group of outstanding young ladies in all aspects, from character to work ethic to ability," Menke said. "It was an extraordinary group of kids that was on a mission." Menke describes Fitzgerald as the quiet leader of the group. "She had very high expectations of herself. She wasn’t necessarily a vocal leader, but she led with the intensity she competed with and in the way she held herself accountable," Menke said. "If a teammate didn’t come up with a pass, Jenni felt it was her responsibility to make a better pass the next time she was in that same position, and more often than not, she usually did." Those standards rubbed off on her teammates. Pam Leslie Loussaert was a junior at North Scott when Fitzgerald was a senior and recalls learning from watching how Fitzgerald approached competition. "She found great balance in the way she approached things. She was very controlled and very focused in how she went about it, always on an even keel, and that led to a very cohesive team," Loussaert said. "We worked hard, took things pretty seriously, and winning was important to us, but we have a lot of fun together. We had a lot of good parental support, and it was good, positive support. They cheered us on, laughed with us, on occasion had a chance to laugh at us and were always there for us. It was everything a good high school athletics experience is supposed to be." "I think we all realized that if we worked together we had a chance to have a lot of success. It wasn’t always easy," Fitzgerald said. "The practices were tough at times, but I think our coaches saw the potential. Coach Menke and coach (Dennis) Johnson, I feel like they understood how good we could be and wanted to help put us in the best possible position to reach that potential." In volleyball, the end result was a state runner-up finish in 1984 and a state championship in 1985. Fitzgerald averaged more than seven sets per game as a senior and was selected as the captain of the all-tournament team during North Scott’s state championship season. "After finishing second our junior year, the motivation was to get back there and win it all," Fitzgerald said. "Things really meshed for us. I remember that we had some great matches against an Assumption team that was highly ranked and we were able to win. That gave us confidence in the postseason." That confidence carried over to the basketball court, where Fitzgerald and her older sister, Robin, helped lead the Lancers to a fourth-place finish in Iowa’s first five-on-five state basketball tournament. The following year as a senior, North Scott rolled through the season with an unbeaten record until Marshalltown defeated the Lancers in the 1986 state championship game. Fitzgerald averaged 18.9 points, 6.5 assists and 4.9 steals per game for a North Scott team that finished with a 25-1 record. "It was a great season that had a real tough ending," Fitzgerald said. "I have a lot of great memories from high school basketball and I have a very real memory of that last game. It took time to get over that, and there are some lessons from it, but it was a special, special season even if we didn’t accomplish what we all wanted so badly." Menke said the steadiness in Fitzgerald’s game allowed the Lancers to build the kind of record they had that season. "It took a lot to rattle her. That just didn’t happen and the team fed off of that," Menke said. "She would get doubled up sometimes, and that just made her that much more determined." Fitzgerald flirted with a track career as a high school freshman, but it only lasted a couple of weeks. "I admire people who ran track but at that point I guess I was cut out more for team sports," she said with a laugh. "It gave me a chance to rest up a bit after basketball and get ready for softball." In softball, Fitzgerald topped .300 at the plate throughout her high school career and was regarded among the top defensive center fielders in the state. With good speed and the ability to bunt from the left side of the batter’s box, she rated as one of the top hitters in the Mississippi Eight Conference. "The Quad-City area has always been really good in softball, and I think that pushed us all to get better," Fitzgerald said. "I remember West having some great teams and a great pitcher (four-time all-state pick JoDee Ogden) that we battled with. The competition was great. It was summertime. School was out. Softball was a lot of fun." But basketball had captured Fitzgerald’s heart. "The coaches at North Scott realized that," Fitzgerald said. "I can remember coach Johnson making sure after a softball practice that the gym was open so I could shoot, and coach Menke gave me that chance after a volleyball practice, too." In an era where sports were more seasonal for athletes, Fitzgerald appreciated the opportunity. "There weren’t a lot of summer teams or AAU basketball teams for girls at that time, so any time I had chance to get in the gym and shoot, that was a good thing," Fitzgerald said. "It was something I really appreciated." Basketball provided Fitzgerald with an opportunity at the collegiate level. One of 10 high school girls basketball players from across the country named by the National High School Coaches Association and Converse to its academic all-American team, the Quad-City Times 1986 female athlete of the year continued her basketball career at Drake. A starter at the point throughout her collegiate career, Fitzgerald earned first-team all-Gateway Conference honors as a senior in 1990. With an undergraduate degree in business administration, Fitzgerald envisioned at the time a career in business that didn’t stray too far from athletics. "At that point, I was thinking about maybe working as a rep for a shoe company or an sports equipment company," Fitzgerald said. She ended up at Southern Illinois, working toward a graduate degree in sports management while serving as a graduate assistant for the Salukis. In 1993, she returned to Drake where she was reunited with former teammate Jan Jenson on a staff headed by Lisa Bluder. She worked with the Bulldogs’ guards, directed summer camps and handled administrative duties for the program. Fitzgerald followed Bluder to Iowa in 2000 and has worked as assistant along with Jenson on the Hawkeye staff since, earning the title of associate head coach prior to the 2017-18 season in her 18th year at Iowa. "The chance to work with young people and be part of a great staff that is in it for all the right reasons, it makes coming to work every day an enjoyable thing," Fitzgerald said. "I don’t take it for granted. This game has been awfully good to me." "She always understood that great teams are a result of great teamwork," Menke said. "She’s a very humble individual who always lifted the performances of teammates ahead of her own accomplishments. She’s in it for all the right reasons." High school All-American football player at Davenport High School in 1957. Led team to 26-0-1 record in three years. Helped Blue Devils to state basketball championship in 1958. All-American and two-time All-Big Eight end at Colorado in 1960 and ’61. No. 1 draft choice of New York Giants in 1962. Played linebacker for 10 years in NFL with the Giants, St. Louis Cardinals and Pittsburgh Steelers. Member of Davenport and Quad-City Times staff for more than four decades. Served as sports editor from 1945 to 1964, became executive sports editor when Times merged with Davenport Daily Democrat in 1964, and served as sports editor again from 1967 to 1977. Won media awards from Iowa High School Athletic Directors Association and Iowa High School Athletic Association. All-State basketball player at Moline High School in 1953. NAIA All-American at Beloit (Wis.) College. Head coach at Hinsdale South, Rich Central, Rock Island, Quincy and Moline. Won 64 straight games at Quincy in early 1980s and 588 in his career. Quincy team won state championship in 1981 and finished second in 1979. Longtime track and football coach at Davenport High School. Won 75 percent of games as football coach from 1923 to 1945, including two unbeaten seasons and eight one-loss seasons. In 38 years as track coach, won 15 state titles and came close on 12 other occasions. Helped design plans for Brady Street Stadium and started Davenport Relays track meet, which now bears his name. Head basketball coach at Augustana for 15 years (1969-84). Career record of 314-99, 157-16 at home. Led Vikings to three third-place national finishes and second place in 1981 NCAA Division III tournament. Won six CCIW titles and had 11 postseason appearances. One of the most successful high school football coaches in Iowa history at Davenport Central. Compiled career record of 156-66-9 in 24 years. Won state titles in 1962, ’66, ’73, ’76 and ’83. Also won state titles in wrestling at Davenport High School in 1954 and ’56. Later served as athletic director at St. Ambrose University. Two-time all-state football and basketball player at Davenport Central. Basketball star at University of North Dakota. Played tight end for four years in NFL with New Orleans Saints and Chicago Bears. Community activist for many years, including service on Davenport School Board. Standout golfer at Moline High School. All-American on Oklahoma State team that won NCAA title in 1963. Turned pro in 1968 and played in 180 PGA Tour events. Won 1972 Western Open. Finished second at PGA and fifth at Masters in 1972, third in 1973 Masters. Played in 1972 World Cup in Australia. Forced to retire by injury in 1978. Operator of golf school in West Virginia. Won seven varsity letters at Davenport Central. State pentathlon champion in 1970, hurdles champion in ’71. Rushed for 1,661 yards in University of Iowa football career. No. 2 draft choice of Dallas in 1976 NFL draft. Played seven years in NFL with Cowboys, Broncos and Packers. Played in Super Bowl XII. Member of Iowa Football Coaches Hall of Fame.